We are a your source for 3M industrial adhesives serving the Canadian market for the last 15 years. 3M Scotch-Weld Hot Melt Adhesive are advanced adhesives to help you improvie productivity, lower cost, and minimize waste. 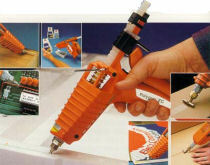 Adhesives are 100% solids thermoplastic resins that become fluid when heated. They are applied in their molten state and upon cooling immediately form a strong bond to most surfaces including wood, plastic, foam, fabric, expanded polystyrene foam and cardboard. The 3M Hot-Melt Adhesive Bonding System has been specifically developed to provide a versatile and convenient method of joining a wide range of substrates used in manufacturing. 3M Low Melt adhesives offer similar performance as 3M Hot Melt adhesive, but help reduce some disadvantages.